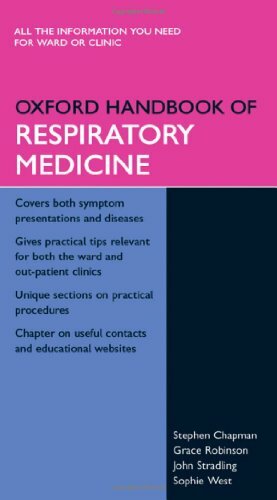 [PDF] Oxford Handbook of Respiratory Medicine (Oxford Handbooks Series) | Free eBooks Download - EBOOKEE! Description: Product Description: This handbook provides a fast, reliable look-up reference on all chest diseases - for junior doctors, trainee specialists in respiratory medicine, and other health workers. First there are chapters on all the major respiratory symptoms. Once the differential diagnosis has been made, the reader can turn to the pages on the respiratory diseases, each of which is covered in a consistent format including practical tips for the out-patient clinic or ward setting. There is a unique section on how to do practical procedures, together with essential technical and reference information. Useful pages on lung and bronchial anatomy, CT anatomy, lung function and blood-gas nomograms, and a list of useful web sites are included for easy reference. Like all the Oxford Handbooks, this handbook combines authority, relevance and reliability. No comments for "[PDF] Oxford Handbook of Respiratory Medicine (Oxford Handbooks Series)".